Azores Whale Watching - Among the Best in the World! 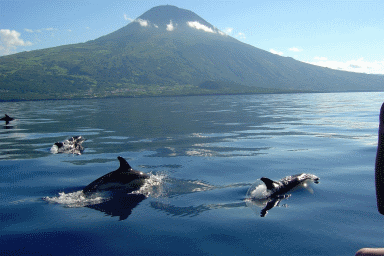 Azores Whale Watching (and dolphins) is known to be among the best in the world. There are 80 species of whales and dolphins on the planet and 24-25 of them have been sighted off the coast of the Azores (depending on the source of information). I find that it is really exciting when you see whales and dolphins up close. It doesn't matter what kind, it's just a big rush when a pod of dolphins decides to come all around your boat and show off. Or when you see a whale's tail up out of the water. The most commonly sighted whales and dolphins are: Common Dolphin; Sperm Whale; Bottlenose dolphin; Atlantic spotted dolphin; Risso dolphin; Short-finned pilot whale; and the Blue Whale. Other varieties of whales and dolphins sighted include: False killer whale; Fin whale; Sei whale; Gervais’ beaked whale; Sowerby’s beaked whale; Curvier’s beaked whale; Northern bottlenose whale; Stripped dolphin; North Atlantic right whale; Killer whale (Orca); Humpback whale; Minke whale; Bryde’s whale; Pygmy sperm whale; Blainville’s beaked whale; Longfinned pilot whale; and Fraser's dolphin. I wish I had personally taken photos of my encounter with whales and dolphins. But I wasn't skilled enough to snap a good picture with my old digital camera. Maybe next time I go! Until then I have found some courtesy of Turismo de Portugal. 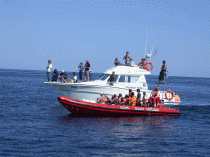 Whale watching in the Azores is generally conducted on small, semi rigid, Zodiac boats like the red one in this picture. You can also go out on a fishing boat like the one pictured or even on a sail boat. But the whale watching is secondary and almost accidental on a sailboat since you do not have the mobility of a zodiac. 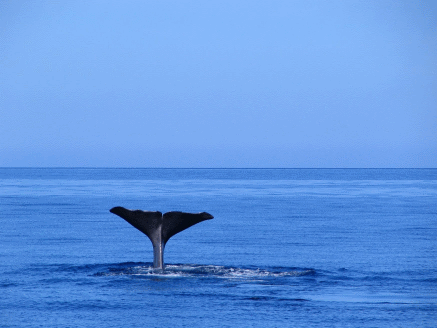 Sao Miguel and Pico have the best Whale watching opportunities. I know that Sao Jorge is also a great spot and there are opportunities from Terceira and Faial as well. I can not say with confidence or experience that there are opportunities from the other islands. But I would imagine there are. I know that there are tours all year round from Sao Miguel. The other islands offer more seasonal service from May to October.